Simple question but I had no simple answer. Actually I had no answer. That bugged me. What kind of Christ follower can’t even tell you where he finds God? I’ve never had God speak to me. He doesn’t talk to me. Honestly, I’m glad He doesn’t. I’m pretty sure I’ll have a heart attack if I wake up to the voice of God. Will He sound like the booming echo in the Ten Commandments or will He have the English accent fresh from Monty Python? Either way I am pretty sure I’d drop dead from fear. I read of a televangelist saying Jesus appears to him while he shaves and they chat it up. If that happens to me I will be unconscious from the moment my forehead bounces off the rim of the toilet on my way to instantly being on my face before God. Where do I find God since He’s not handing me a towel in the morning? My friend’s question nagged me for a couple days until the “ah hah!” moment hit. It’s a little bit gross but stick with me. The answer came when I was riding a local trail by the city sewer plant. The stench was as awful as ever from the giant mixers churning the lumpy brown water in huge, outdoor, cement pools. When i was riding past, trying to hold my breath, a bunch of little birds decided to play with me. When I approached them in their spot on the chainlink fence, they darted out in front of me to the berry bushes on the other side of the path. 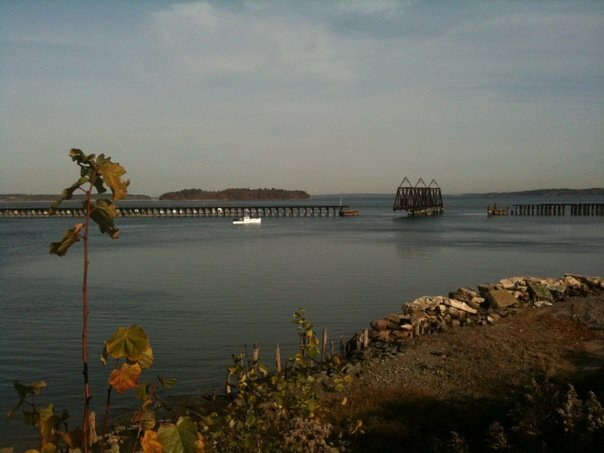 Looking for them I had to also see the view of the Maine coast with a rusty train tressel stretching across the bay. Not seeing the birds, I started noticing the stench again. Woosh! The birds were back on the fence making a racket. I think they were laughing at me. A few of them almost hit me when they darted back to the oceanside. The clouds were piled on top of each other like cotton and the water was a vibrant blue. The sewer plant was behind me now. And that’s where it hit me. My friend’s question was a mystery to me because I don’t have to “find” God at all. Instead I just have to see Him in every setting and every circumstance. He saturates everything. I think we all tend to focus on the sewage too much. Maybe those birds were laughing at me because I was so busy complaining about how bad things smelled that I was missing God’s handiwork. I was missing the mystery of the divine. Maybe God used those birds to speak to me? Naah, that’s crazy talk, right? This entry was posted in Christianity, Find God, leadership, mystery, religion. Bookmark the permalink. YES. Sometimes I feel like God is doing stuff just for me to see (sounds selfish and childish). He doesn't need to use words, but if He did I am sure he would be saying "Hey Hannah, look at my sun setting for you". Or sometimes it is more like.. He just makes something work in a way I never would have imagined or even hoped to dream! It's like I am looking down and when I finally look up I am just in awe of His creation and what He has planned for me. They key is to look up!